What. A. Mess. Please observe that she got herself into the ottoman cube first before climbing up onto the toy table. The girl is into everything! She's walking! Can you believe it?! 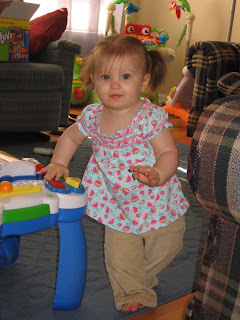 We have been counting her (independent) steps lately, and the highest she had gotten to was four. On Monday night, she had to go to work with me because Casey was working, too, and apparently she decided that was her moment to take off. I saw that she was going to take a few steps, so I started counting.... all the way up to 18! After that, it was all over. She just walks around all over the place now! She will drop back to her knees and crawl if she's really in a hurry to get somewhere, but she's much more confident with her walking now. My baby will be 10 months in just a couple of days, and she's already walking around the house! I think I'm still in shock. 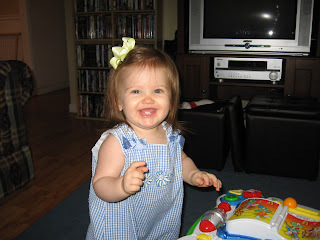 :) We haven't had the video camera around when she's been walking yet, but we will get video soon.